The Hollande-Merkel-Tsipras agreement on Monday is being described as a capitulation by many major newspapers [Telegraph, Bloomberg, Times, BBC, MSN, EU Observer]. “Brutal” and “humiliating” is how The Economist choose to describe the terms of the agreement. The Western press seems to be suffering a bad case of sensationalism and hyperbole. The deal is nothing so dramatic. Around the time of the Greek referendum, German policymakers were converging to the hardline position that Greece should be pushed out of the eurozone; a position championed by the veteran German finance minister Wolfgang Schäuble. The political optics changed after the results of the referendum were announced. Apparently, Luxembourg Foreign Minister Jean Asselborn’s dire warning to Angela Merkel, that pushing Greece out would be a “catastrophe for Europe”, pulled the Germans back from the brink. 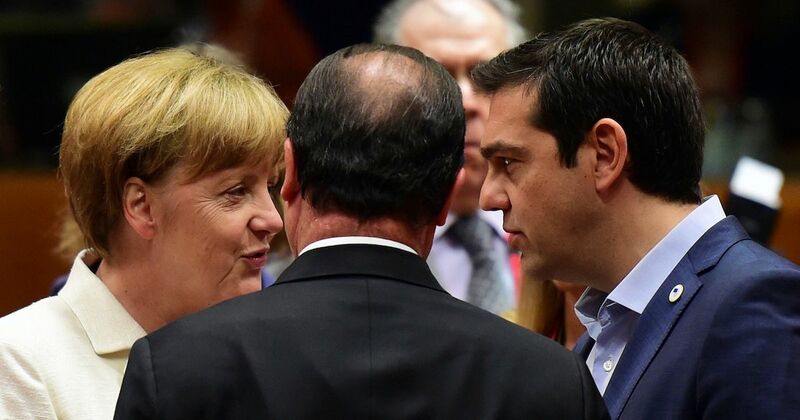 Merkel agreed to let Hollande play the good cop routine with Tsipras. Hollande arm-twisted Tsipras to concede on far-reaching reforms in exchange for relief on austerity. Tsipras has agreed to push through a package of reforms through the Greek parliament. It includes an overhaul of VAT and income taxes, pension reform, labor market and financial reforms, and the privatization of utilities. This is certainly a surrender of sovereignty. But consider that Greek institutions were and are highly dysfunctional and in dire need of reform. That the Greek governement has to push through these difficult reforms under EU supervision is not the worst thing in the world. Even the much-feared labor market reforms only aim to bring Greece up to Western European standards. It is reasonable to expect that the Greeks themselves will be strictly better off as a result of these reforms. As for austerity, the agreement calls for a primary surplus target of 1, 2, 3, and 3.5 percent of GDP in 2015, 2016, 2017 and 2018. This is an improvement over the 2012 bailout agreement which called for 4.5 percent of GDP in 2014, 2015 and 2016. The numerical proximity of these numbers is an optical illusion. The difference is that between catastrophic and mild austerity. The agreement also calls for what amounts to a medium-term stimulus of €35 billion for Greece. This is a substantial concession to macroeconomic reality. Greece gets to keep the euro as a ward of the European Union. The ECB will now ensure than the Greek banking system does not implode. The government has to undertake substantial and far-reaching reforms under EU supervision. In exchange for a surrender of sovereignty over national policy to the European Union, the Greeks are spared from continuing to endure the equivalent of a Great Depression. The deal is nowhere close to being ideal. But for what it is, it is not catastrophic for the Greek people. The Greek saga, of course, is very far from over. It will continue until a substantial portion of the debt is written off. Meanwhile considerably more significant market developments are underway half-way around the world. As I predicted, the asset price bubble in China is beginning to unravel. The stock market collapse is likely just the beginning of a major bust that will eventually lead to a lower-growth trajectory for the Asian giant. We are entering a new, perhaps more violent, phase of turbulence in global markets. I work as an investment manager for a real estate private equity fund in China. From my observation, I believe that there is simply no room for a major bust in asset prices in China. Before the recent stock crash, I admit that there is an obvious bubble in the stock market of China. 2 years ago, I believe that real estate was overpriced and oversupplied in many locations of China, though there still are certain pockets of undervalued properties worthy of investment. For instance, I personally bought an condominium at presale for RMB 2.45 million toward to end of 2013, when the market was the hottest. I just received an offer at RMB 3.65 million about two weeks ago. Real estate is just too localized an industry, and China too big a country, for sweeping arguments. But now, I believe bubbles have been mostly absorbed. Particularly, I believe that luxury housing in 1st tier cities, something most prone to asset bubbles, are comparatively undervalued. Inventory in 1st and 2nd tier cities has fallen to around 12 months of sales. Since it takes at least 12 months from land acquisition to presale. 12 months of inventory indicate that construction has to pick up in Q3 and Q4 this year, or no later than Q1 2016, to prevent future shortage. I am afraid I must disagree with you there. The Chinese bubble is built on real estate. The problem is the borrowings of the state-backed enterprises are premised on real estate collateral. The Chinese bust is going to hit real estate big time. Real estate is not isolated behind firewalls. It is exposed to the Minskian flows in the world economy; just like other asset markets. In the case of China, the confluence of policies have led to a ponzi scheme in Chinese real estate. It will collapse. To what I understand of the evolution of real estate industry in China, lending to real estate is one of the most transparent, competitive, healthy, and therefore robust credit market in China. All the fundamentals look pretty good. Unlike in the west, where home buyers only need to pay 5% down payment, home buyers in China have to pay 20% for extremely affordable, first homes, 30% for normal first homes, 50-70% for second homes, and 100% for third homes. Most home buyers outside of 1st and top 2nd tier cities rarely borrow mortgage at all. Unlike in the west, where RMBS/CMBS leverage property up to 90+%, leverage of commercial loans for existing property in China is artificially capped at 55% based on appraisal value. Unlike in the west, where interest coverage ratio & leverage ratio based on appraisal value are mostly used to compute commercial loans for existing property, in China, borrowers are supposed to payback the interest & principle within 5-10 year loan term solely by rental income. Unlike in the west, where municipal bonds are mostly guaranteed by tax alone, the SOE loans, especially those infamous LGFV loans, are guaranteed simultaneously by the land, the SOE, the muni government, and often also the infrastructure for which the loans were drawn to build. Unlike in the west, where the norm for interest rate is LIBOR+basis points, interest rate of most commercial loans made in China is fixed, and immune to interest changes throughout the loan term. Last but not least, rental growth are significant and broad based, at perhaps the 60th consecutive month by now, and also accelerating. Positive carry is evident in most 2nd tier cities. Negative carry, by a small margin, only occurs in 1st tier cities, where rental growth in the most significant. There are, lackluster municipalities that borrow on fake land title, to spend on social welfare and fake infrastructures, which are basically very similar to what happened in Greece. But unlike the European Union, the CCP central government hunts these liars down and remove them disgracefully. Just don’t let those twats at news stations fool you. Most of them have never been to mainland China, let alone actually practiced real estate investment. Even most senior analysts/economists of major investment banks who actually cover the real estate sector rarely visit China more than once every quarter from their cocoon in HK. Perhaps one or two adventurous ones have ever stepped in a real estate sales/leasing office. I am not being cynical. Many of my classmates hold these positions. They ain’t know nothing about what’s going on. Basically, all the risk has accumulated at the local government level. The opaque LGFV debt amounts to something like $5 trillion to $7 trillion: No one really knows the true scale and that is part of the problem. All of it is backed by land. Therefore, even though highly dispersed, the system is extremely exposed to a collapse in land prices. Asset price booms are propelled by Minskian flows, i.e., the tidal movements of savings. This is why bubbles migrate from one asset to the next. The reversal of these flows triggers the bursting of bubbles; moving from one asset to the next. The scales of the busts differ depending on the peculiarities of the asset markets. But the underlying driver of booms and busts is unitary: A single systematic factor affects all asset markets; they are all tied at the hip. The stock market bloodbath in China is a signal: We are close to the unraveling of the Chinese asset price bubble. It is not clear that Beijing has the firepower to hold the tide if the real estate bubble bursts. In a legal sense, it certainly does. After all, the state owns the land. The question is: At what price? My position is that a hard landing for the economy and convergence to a lower-growth regime is the baseline scenario at the point. Err…this is exactly the kind of misinformation I was referring to. By all credentials, Chen is a respected economics scholar. But to say he can speak as an industry expert of either banking, real estate or tax stretches credibility. The things he got right are the vanilla Wikipedia stuff. The things he got wrong are the nitty-gritty that differentiates an insider from a layman. China’s gross debt-to-GDP ratio, while being high, is supported by one of the highest saving ratio on earth, and one of the most under-accounted GDP figure. The Deutsche Bank report on LGFV, for instance, is a good piece of work, at least as good and candid as it gets with publicly available data. But Chen’s simplistic use of that report shows that, with due respect, he doesn’t know much about what’s actually going on. For example, “Indeed, the beginning of 2015 marked a turning point for China’s real estate market.” That’s just not true. The turning point was Chinese New Year of 2014. After being soft for the last 15 months, the housing market is making a come back. How can anyone with decent understanding of monthly sales data mistaken “turning point” by a margin for 15 month? Another example, “Since China is not a democracy, allowing local governments to sell bonds could establish a dangerous precedent, leading them to freely issue debt without any real intention of paying it back, which is what happened in the early 1990s.” There are several things that are wrong with this single sentence. 1) NPL in 1990s was mainly due to mismanagement of SOEs, which had utterly no sense of market economy down to HR and accounting methods, NOT because of free-roaming local governments. And 2) democracy does NOT necessarily leads to financial accountability. Bad examples like Greece aside, the often-used Britain was hardly a democracy until after WWI. 3) Just because local governments can borrow, does not mean banks or investors would lend. With all the collateral and authority, LGFVs/local governments often borrow at 9~11%, which is actually higher than listed corporations and large non-listed corporations, and on par with non-listed businesses. I believe this figure justifiably compensates the risks. And taxes. China’s gross taxes, including social security and healthcare, are not high at all. Don’t ask me why. That’s part of how I make a living. U.S. gross taxes are high, despite the loopholes. And the “mixed ownership” experiment. While the state still nominally hold majority share, the companies are morphing toward private control and efficiency. Control and holding aren’t necessarily the same thing. Last but not least, “Today, household consumption accounts for only around 35 percent of China’s GDP” is, by far, the most striking nonsense. Anyone has stayed in U.S. and China for extended period would disagree with such statement. There are simply more services that are more convenient in China than in U.S. Among many other things, different accounting method employed toward owner-occupied homes, i.e. China’s straight line deprecation on cost vs U.S.’s assumed rent, could pump up that figure for approximately 10%. What is exceptionally striking to me that although this “35% service GDP myth” has been widely acknowledged by most actual economists who actually make a living off their macroeconomic projections, Chen could make a mistake here. I spend the time to write these things because I respect and enjoy reading your writings on geopolitics, and wish to reciprocate. It’s your freedom to ignore what I say, and continue to be lead on by headline articles written by unprofessional talk-shops. It’s your choice.